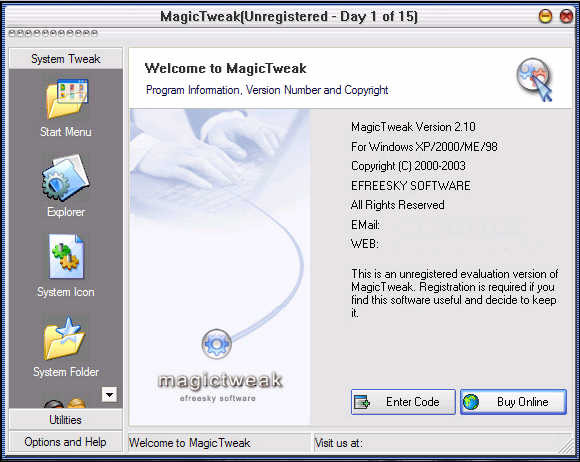 Magic Tweak - MagicTweak is a special program designed to optimize and personalize Microsoft Windows. It provides one-stop, instant access to a variety of Windows settings that can be altered for a friendlier Windows environment.This unique software makes it easy to tweak hundreds of hidden settings in Windows XP/2000/Me/98, so there is no longer any need to dig through the registry looking for that specific setting (from the Start Menu, Desktop, IE skin, System Icon to System Security) that just doesn't seem to be there.With the ability to customize almost any aspect of Windows, you can become a Windows expert almost instantly! A more efficient way to uninstall programs. Clean up all the unwanted history data on your computer to protect your privacy. Find and remove unnecessary files on your harddisk. CleanMyPC Registry Cleaner - Clean Window Registry with ease and boost your system performance. Hot !